Jonathan is a classic 19th century American apple variety, noted for its high quality flavor. It rewards being eaten fresh between October and Christmas, but is a good keeper and a good variety for the kitchen. Jonathan apples were exported to Victorian England and the English pomologist Robert Hogg rated it as "a very fine dessert apple". 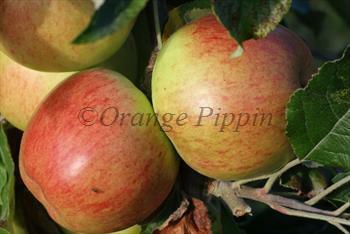 Fill in the details below and we will let you know when Jonathan apple trees are back in stock. Jonathan is often considered to be fully self-fertile, but in practice cropping is greatly improved if there is another different variety nearby to pollinate it. The main challenge with growing Jonathan is its poor disease resistance. Don't let the extensive list of disease susceptibility put you off, in reality the situation is not quite as bad as it looks, and it is worth a bit of effort to get such excellent flavor. However it is perhaps not a good idea to rely on Jonathan as your only apple tree! According to the Victorian pomologist Robert Hogg, it was found on the farm of Philip Rick of Kingston New York, in the early 19th century. It is thought to be related to Esopus Spitzenburg. However as with many old varieties there are many stories surrounding its origins. Visually and in terms of the quality of flavor, the relation with Spitzenburg seems likely. Jonathan's excellent flavor and good keeping qualities have led to it being used in many breeding programs.